In a throw away society, people rarely think about what happens after they toss their plastic water bottle in a trash can instead of the recycling. After many years of personally using plastic, I decided to make a small change to a more environmentally friendly life style. In my first attempts at a more sustainable daily life, I first used a Nalgene bottle. Like most people, upon learning more about the dangers of PCBs (Polychlorinated biphenyls) I retired my trusty UC Santa Cruz Nalgene. Shortly there after, I jumped on the Kleen Kanteen train. Though I still use my Kleen Kanteen from time to time, I decided to shift towards a different kind of reusable water bottle, a corked, 750 ml, glass bottle. 1. In order to be more environmentally friendly, cut down on the petroleum used to manufacture plastic and to decrease the amount of waste in landfills, I have chosen to opt out of using plastic water bottles. Though recycling receptacles are readily available in most public places such as the park or the mall, and found in most homes and neighborhoods, plastic rarely finds its way to the recycling center. According to an article in Time Magazine, in 2005 the US produced 28 million tons of plastic waste, 27 million tons of which ended up in landfills. A mere one million tons of plastic was recycled, despite recycling containers, despite children being taught to ‘reduce, reuse, recycle’, and despite many peoples rational that they should use plastic for the sole reason it is recyclable. 2. Plastic was created to be a durable material. Because of this, it’s life span is very long. Approximately 1,000 years of durability. If you think to a thousand years from now, our children and children’s children, will still be burdened by the waste we’ve left in landfills. According to TIME magazine, plastic now take up 12% of our trash in comparison to the 1% in 1960; these bottles are taking up space in landfills that could be designated to other waste. 3. Dangers to my health. When I used plastic water bottles, I would leave them in my car, taken them to school, the gym, work, and use them for days on end. My thinking being of course, that if I was going to use plastic, I was going to get the most out of each bottle. Little did I know, by doing this, I could have been putting myself at unnecessary risk of PCBs. By exposing plastic bottles to heat and normal wear and tear, harmful PCBs were leaching into the water I was drinking. 4. As a recent college graduate, saving money is always a priority. I found myself buying cases of water from Costco, or just getting a bottle or two a day at the store. Say I would buy a case a month, 5 dollars a month, for a year that cost me $60. Now that number won’t break the bank, but if I was buying a bottle of water day from the store at two dollars a day, I was spending $720 a year! Buying a Brita filter for my fridge cost about $15 dollars. Filling up my glass bottle with water from the Brita paid for itself in a matter of days. 5. Glass is an expensive material, however unlike plastic, it can be reused multiple times. When exposed to heat, it does not leach out any undesirable chemicals into my drinking water making it safer for me. 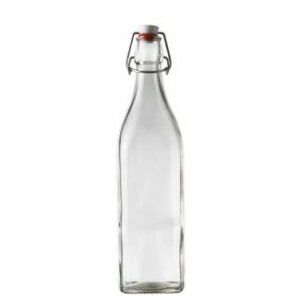 In countries like Denmark, refilling glass containers is actually preferable to using plastic containers. In poorer countries like Brazil, refilling glass bottles for things like soda, is cheaper and recommended instead of A) making new glass bottles or B) using plastic. Reusing glass saves about 315 additional kilograms of carbon dioxide from being released into the atmosphere from the production of new glass. And drinking out of a glass bottle instead of a water bottle is more fun and interesting! It’s a great conversation starter and you can explain to others why you’ve chosen to be more environmentally conscious by making the switch to a safe reusable drinking bottle!